Fashion for smartphones with large screens has been observed for many years. The ideas that have brought into the world of gadgets devices from Samsung, like many buyers. Subsequently, their thoughts on such models have realized different manufacturers. The diagonals are growing very fast, smart phones are almost equal to this parameter with small plates. Models of this kind should not be taken as a means for making calls, of course, this feature is not present here, but because of the impressive size of such devices for long conversations is not very convenient. 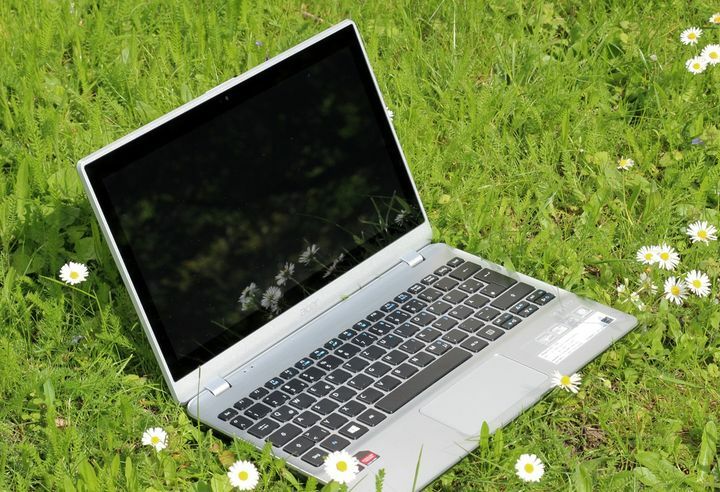 Instead, they offer all the benefits of a large screen for easy viewing video, the Internet and social networks, comfortable correspondence with a large keyboard, the role of the navigator or the means to play. 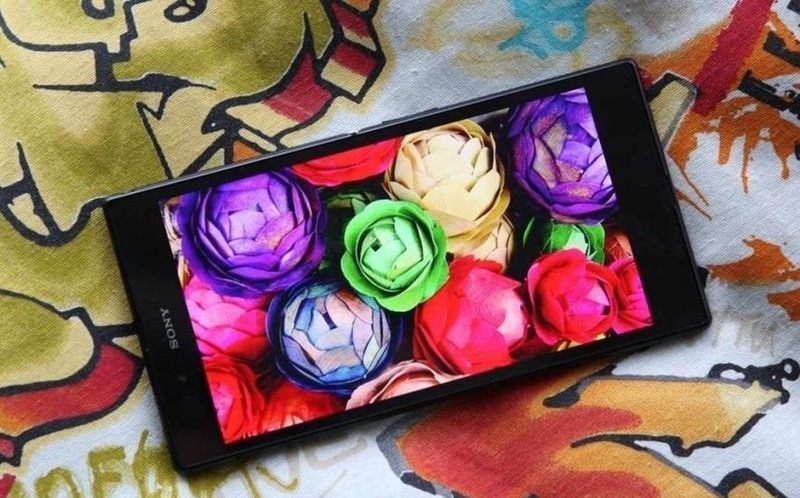 Sony Xperia Z is considered one of the most stylish phones, submitted this year. The original design of the housing, protection from water and dust, 13-megapixel camera, and a very productive filling with a large 5-inch FullHD-screen TVs have become significant arguments for buying a new smartphone. However, such an impressive diagonal is not uncommon, although to say that such a display size may not be sufficient, however. Considering the general sympathy for the huge diagonal, who presented the market with Korean and Chinese manufacturers, Sony also decided to show their capabilities. 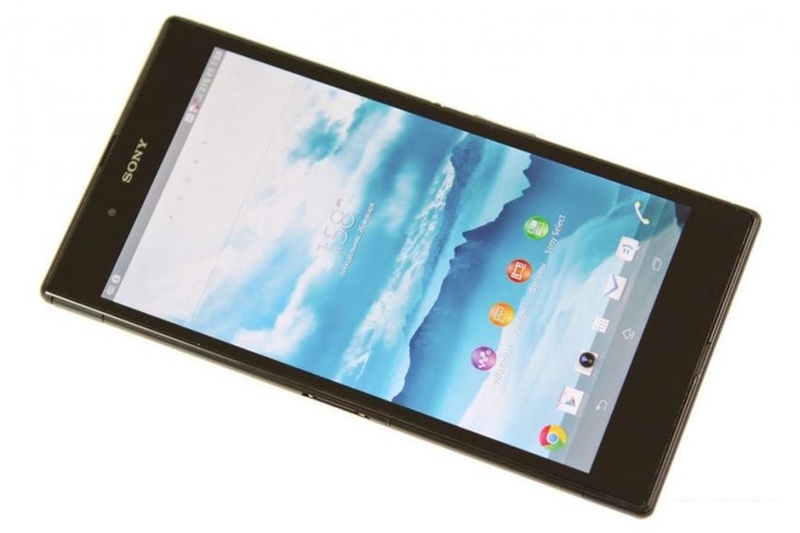 Thus was born the Xperia Z Ultra, which received 6.44-inch display with FullHD-resolution. However, this did not stop the Japanese and offered an even more powerful stuffing in the face of the new Snapdragon processor 800. Hardly anyone can complain about the poor performance Sony Xperia Z, so that you can now get even more impressive headroom. This is clearly shown by tests in which new shows very good results. 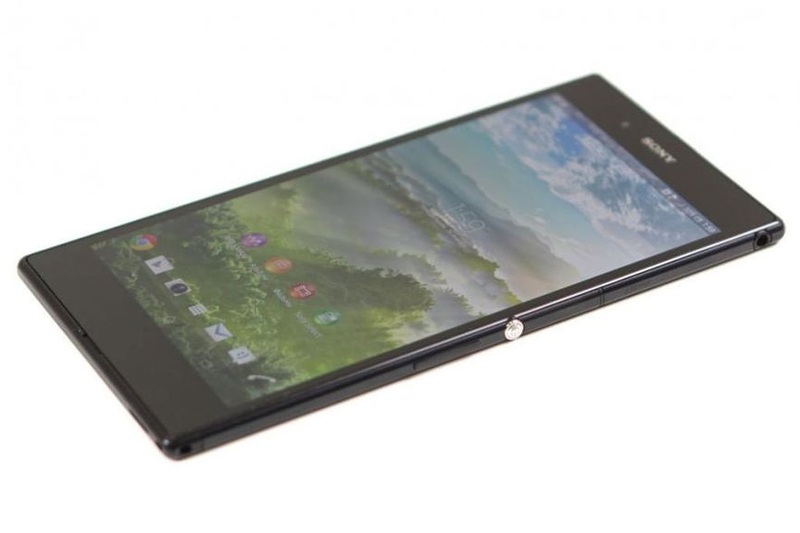 On this idea did not end Sony, Xperia Z Ultra was very thin smartphone. Is so large, but at the same time, thin models on the market simply do not, then he went to all of their competitors. Do not forget about the moisture protection, and like the Xperia Z, this model feels after being in the water, as if nothing had happened. We tested was a version of Sony Zperia Z Ultra, designed for the Asian region. The set included a good quality stereo headset, cable and charger. On the screen of the phone glued shipping film, if it is removed, it is possible to find a factory film on display for added screen protection. Sony stays true to herself and still does not make any new steps to change the look of. The smartphone was very similar to Xperia Z, but the size of the housing have grown substantially. Given that the tablets produced 7-inch screens, the new product from Sony came up to him literally back to back. At the same time a very compact housing has turned to such a device. With a thickness of just 6.5 mm, it is one of the thinnest smartphones on the market. 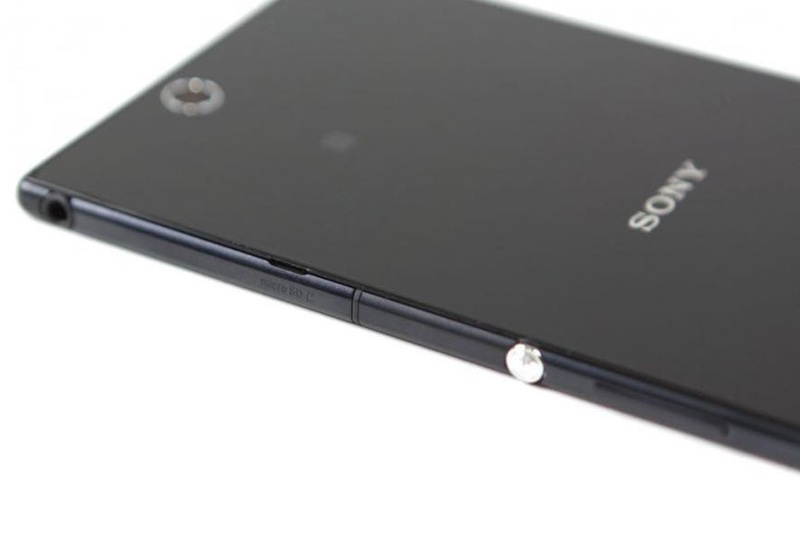 For example, the thickness Xperia Z is 7,9 mm. As can be seen, the already slim body made even smaller. The weight does not exceed the reasonable scope, 212 g of such area do not seem unfeasible. The concept OmniBalance, which gives a symmetrical surface face, still pleasing to the eye. A solid frame around the body with sharp corners and the glass on both sides of the body will also become familiar features of smartphones Sony. The controls are the usual places for this brand. All of them brought to the right side, where the middle is a round screen lock button. By the way, it turned out not as protruding as on Xperia Z, where it seemed to me more comfortable. There have to press hard on it, it’s not so comfortable. To the giants of this size can be attributed Huawei Ascend Mate. 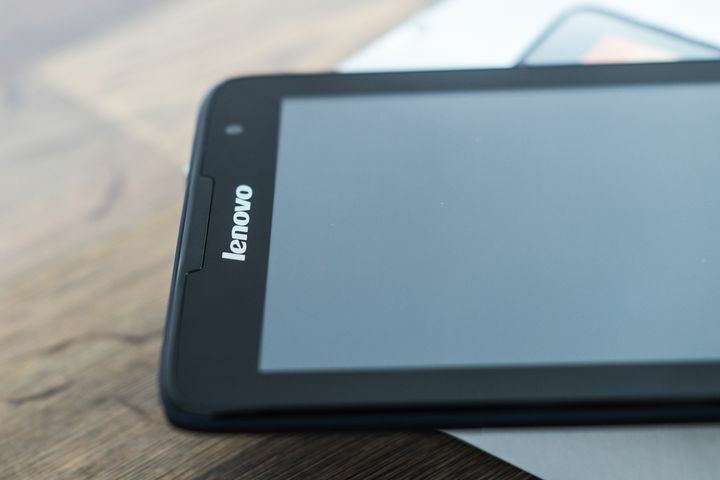 It has a 6.1-inch IPS-display with a resolution of 1280 x 720 pixels and a large battery with a 4050 mA * h The smartphone weighs 198 grams, it measures 153.5 x 85,7 x 9,9 mm. In general, due to a very wide body to keep the smartphone in your hand and press the button with the same hand would be uncomfortable, it is easier to operate a second hand. This is the fee for the screen size, the owner of the device to be ready for it. Use the device too easy, one-hand it does not embrace, so the question of where to put a marker phone will often get up in front of his owner. Optimal format using smartphone – turn it on its side and use it as a tablet. In this case, perform various actions with the device will be much more convenient. Connectors for microSD memory card, are nearby and closed one large flap. MicroSIM is set in a small pan and placed in its position. Conveniently, it does not need to take it out with a paper clip or some other improvised. Samsung GALAXY Note II with 5.5-inch screen is not the largest machine in the line of smartphones Korean brand. GALAXY Mega 6.3 offers PLS-display with a HD-resolution. But he’s less productive filling, but more pleasant price tag. Korean giant dimensions are as follows: weight of 199 g, 167 x 88 x 7,9 mm. Like a number of other smartphones Sony, Xperia Z Ultra resistant stay in the water without any unfortunate consequences. Declared level of protection IP55/58. What is interesting, there is no plug in 3.5 mm jack, Sony previously offered to close it with a lid. But in such a microUSB port option is provided. 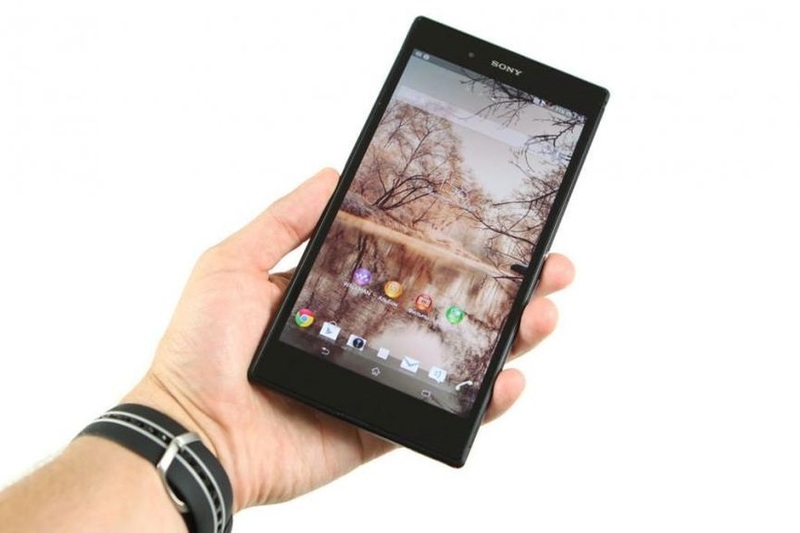 Display Sony Xperia Z and other smart phones of this brand over the past year has been the weak link in the list of characteristics of a smartphone. Any comparison with competitors showed that here, and small viewing angles and low contrast. But in the Xperia Z Ultra bear this point, the smartphone offers a higher quality screen than the Xperia Z / ZL. Now the picture on the screen does not fade and will not tarnish, the model can be easily compared with the best representatives of their class. Of course, given the huge diagonal dot density here is not as high as in other devices such as HTC One, Samsung GALAXY S4 or new LG G2, while at the same time the display is called smartphone not sufficiently clear. When the density of points, which is 342 ppi, it is comparable with the Sony Xperia S, which has turned out exactly the same result with a diagonal of 4.3 inches and a resolution of 720 x 1280 pixels. The smartphone technology is used Triluminos, who came here from TVs Sony. It allows you to make the red and green colors more vibrant and juicy. Smartphone has a high-quality IPS-matrix, which excludes a significant distortion of colors and has great viewing angles. It does not have the flaws that could meet users Xperia Z, the contrast is not falling, no problem, if you look at the display from the side. There is a light sensor and the ability to adjust the screen brightness automatically. But it is worth noting that the sensor does not always work correctly and may be easier to put the optimal parameters manually. 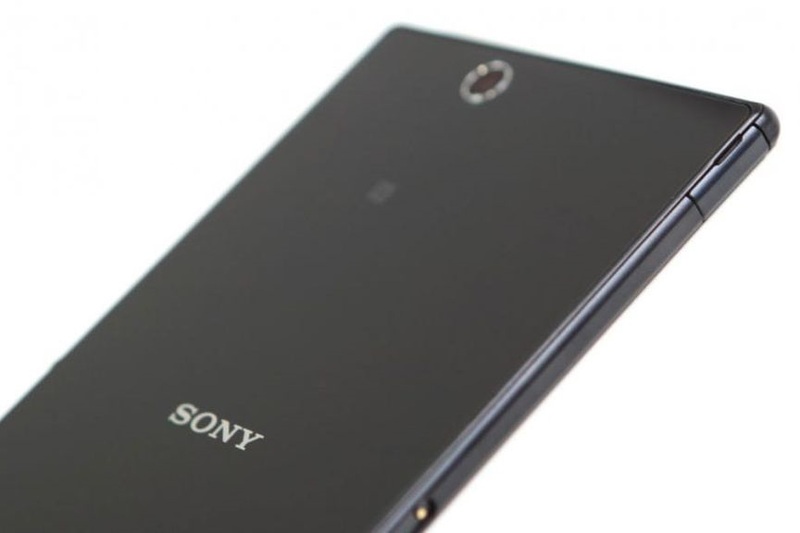 Sony Xperia Z Ultra was the only smartphone on the market that offers great FullHD-diagonal and resolution. So far, no other brand can offer in their devices displays of comparable quality. The closest competitors – Samsung GALAXY Mega 6.3, Huawei Mate – lagging in this respect. As usual, the display is closed durable glass. From film to screen in Sony also did not refuse, so she carefully glued on top of the touchscreen. Notice it is very easy: if you do not know about its existence, something about it you can not imagine. At the same time the film addresses the role of oleophobic coating, so it is better not to unstick. Incidentally, the film is on the back, where it covers the glass surface. 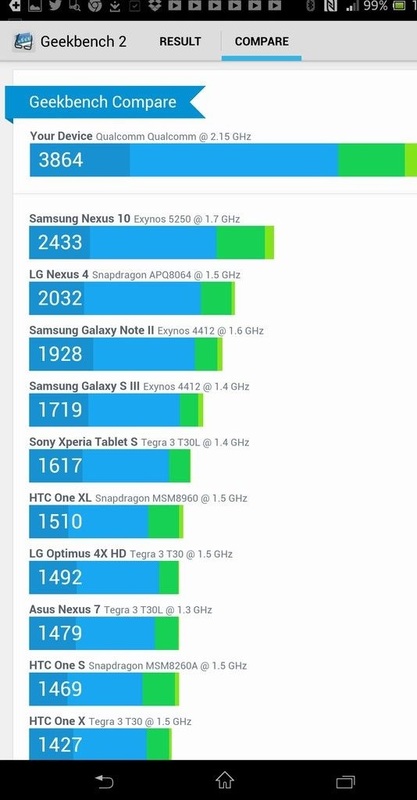 Detailed testing screen Sony Xperia Z Ultra edition held expert Mikhail Kuznetsov. 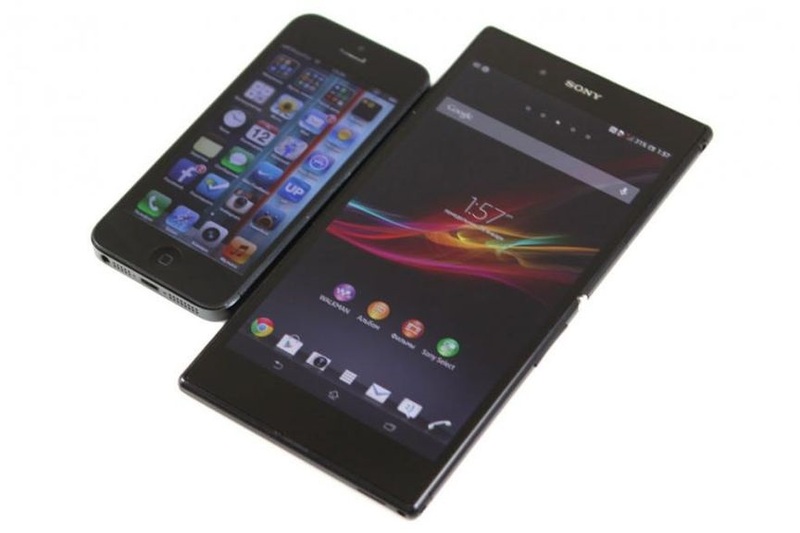 Past smartphones Sony – Xperia Z and ZL – caused a lot of criticism with regards to the quality of the screen. 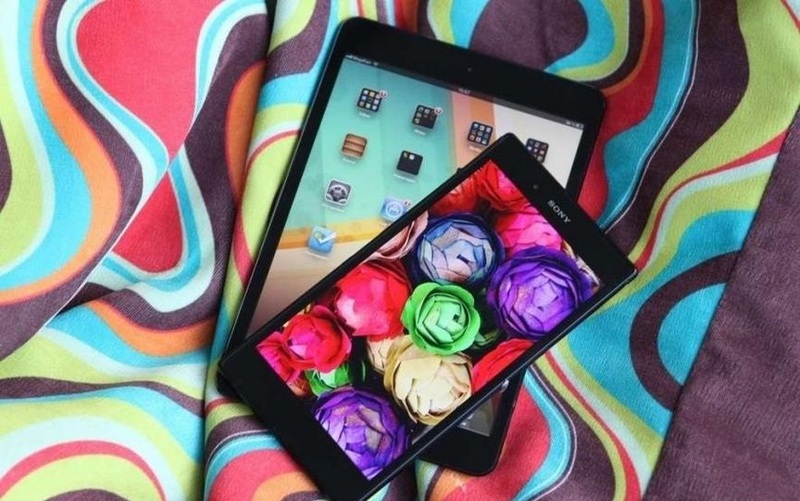 But since then, the company Sony Mobile embarked on the path to reform, and the latest products are more quality screens – for example, a tablet Xperia Tablet Z. 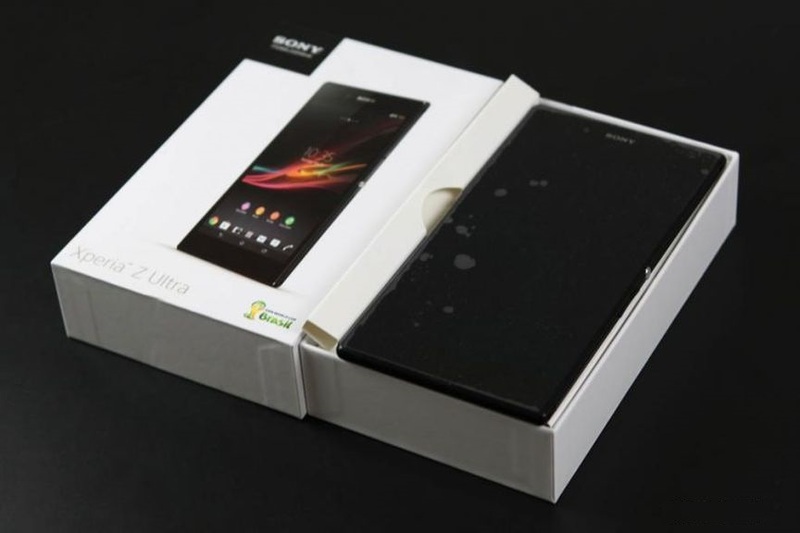 Now we will study the latest model – Xperia Z Ultra with a huge (by the standards of smartphones) screen diagonal of 6.4 inches and a resolution of Full HD. The pixel density of 344 ppi, the image is very clear, including the fine print. Measured at maximum brightness is 425 cd / m 2, such a reserve would be sufficient. The contrast ratio is now at a good level – about 930:1, which is almost twice as good as the screen Xperia Z. This and more deep, rich images. By the way, the screen performs well in direct light, thanks to laminated glass OptiContrast. Lack of air space between the glass and the screen allows the image is not “fade” in bright outside light. Viewing angles are significantly wider than the Xperia Z – color angle shifted slightly, but the contrast is gradually falling. This is because black is rapidly becoming purple tide, the image at an angle could lose depth. 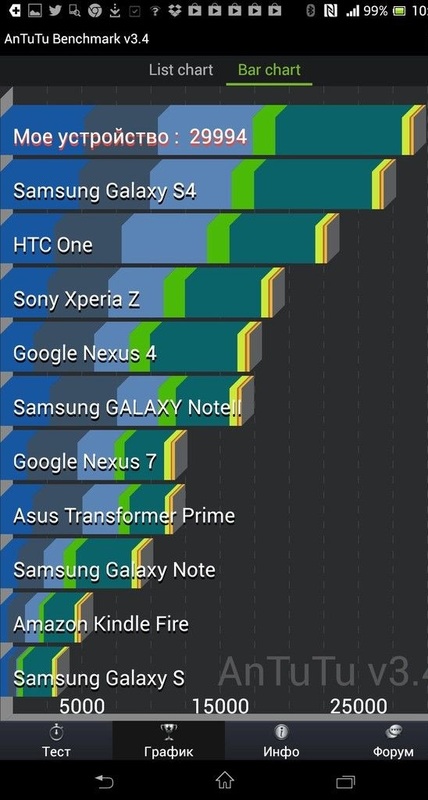 Perhaps, this parameter Xperia Z Ultra still lags behind the best representatives with LCD screens IPS. The increase of brightness signal relative gamma curve causes some problems. The average range of 1.82 – this is well below the optimal value of 2.2. The image looks brighter than it should be, and the lighter shades are less legible. The average color temperature is close to the standard 6500K. But at the extreme range of balance. Dark areas go into the cold shade, light – on the contrary, in the warm. However, the spread is not so high to seriously appear on conventional images. Errors expressed in the color deviation DeltaE, naturally reflect these differences. DeltaE value ranges from 2 units (very good) to 8 units and above (satisfactory). However, such adjustment can be called as acceptable because of serious drawbacks to the naked eye can not see. The color gamut is close enough to the standard sRGB. The main colors are oversaturated and somewhat shifted in hue, but these deviations are not too noticeable when compared with the standards. Errors color expressed in DeltaE, an average of about 4.08 units. Given the good contrast of the screen, the colors on it always looks quite deep and natural. Curiously, the backlight of the display is referred to the Sony technology TRILUMINOS, which should give an extended color gamut with respect sRGB. 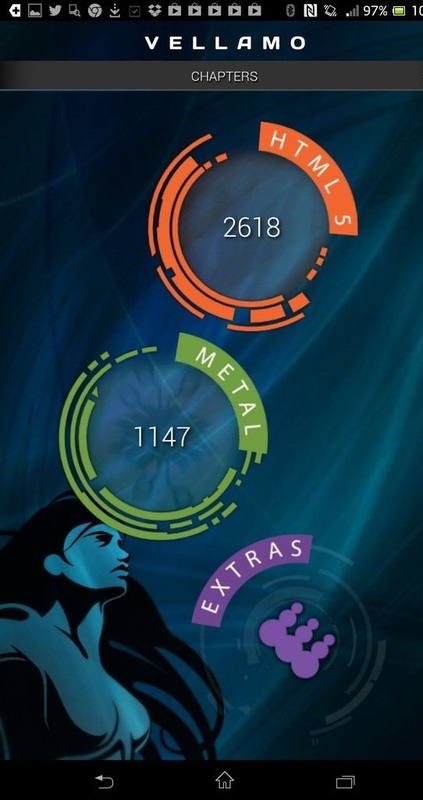 In fact, here is similar to the color gamut screens Xperia Z and ZL, a major gain in the spectrum is observed. But it’s even better – excessive saturation would make the colors on screen unnatural. Activation of image processing Bravia Engine 2 provides an interesting effect. The fact that he did not notice any eye or instrument … compare multiple photos and videos in both modes (On. / Off. ), I could not detect any differences. Quite possibly, this is purely a software issue, and on our test sample processing is simply not included. In general, this question is best to defer to future updates, which Sony promised to “upgrade” the processing before X-Reality Mobile. That’s when I hope we will be able to evaluate the performance of this function in full. As a result, it should be said that the screen Xperia Z Ultra not only large (that is so obvious), but also good in quality. Minor flaws, overall, did not spoil the overall impression. Progress on past models is good – now displays Sony in the asset has a good contrast (albeit not a record) and adequate viewing angles. That is, for most people the experience of the screen Xperia Z Ultra must be extremely positive. Although high-level smartphones is no longer a rarity. The same processor is used in some other smartphones. 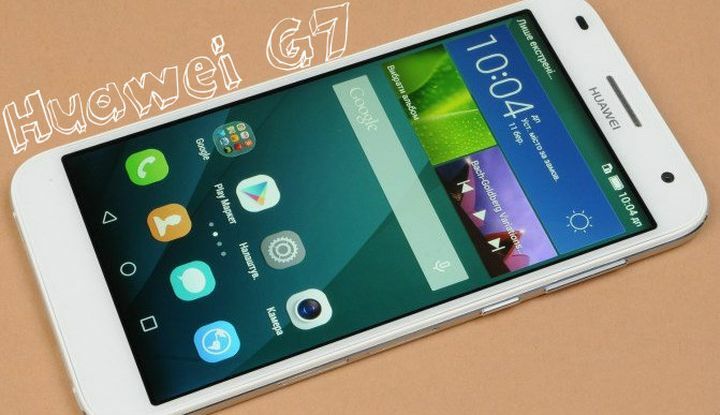 Its got a Samsung GALAXY S4 LTE-A, LG G2, ZTE Grand Memo. Sony Xperia Z Ultra is the first model of the Japanese manufacturer on the market with the new Qualcomm Snapdragon processor 800. Four cores, the operating frequency of 2.2 GHz, Adreno 330 graphics, 2GB of RAM, 16 GB of internal memory. As usual in products Sony, here there is space for a memory card. 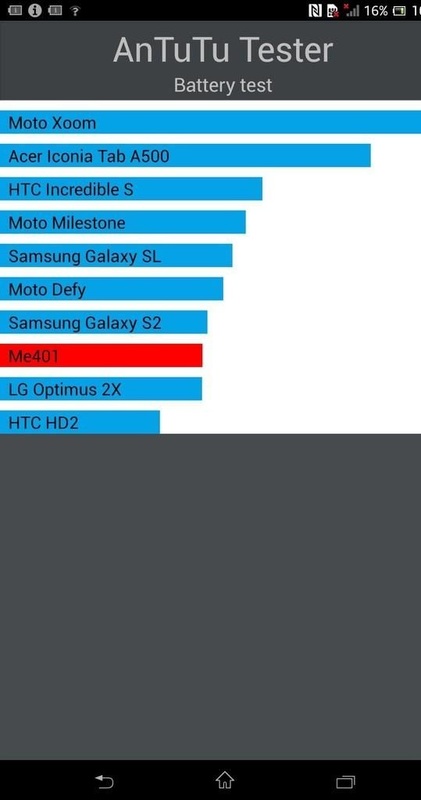 All the tests give very good results, we have not just the most powerful smartphone Sony lately, but also one of the few smartphones on the market with this processor. For a number of tests it bypasses its competitors, such as the HTC One, Samsung GALAXY S4 with an eight-chip. Smartphone tested modifications for Asia supports only 2G/3G-seti. 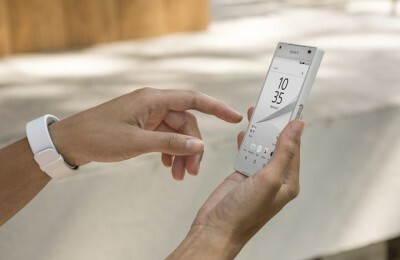 Most likely, a model that will be available in Russia, will support 4G-range, such a version exists, and it is unlikely Sony refuses to deliver to us the idea of ​​this model. 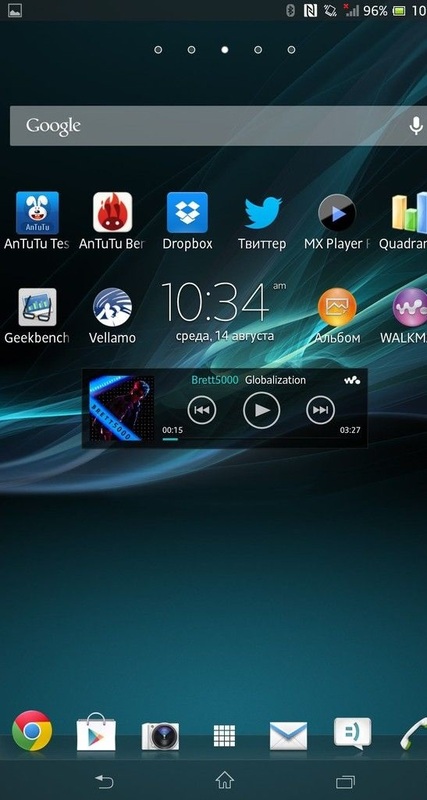 The original interface is combined with Sony’s Android version 4.2.2. Serious changes have occurred, all familiar. Given the gigantic size of the smartphone, now located on the bottom line of seven application icons and menu are five programs in a row. Let me remind you that the Xperia Z was five icons at the bottom of the main screen and four in the menu. Sony wisely uses the available space, optimizing the design for convenient use. Still available mini-applications that are submitted to any location on the screen. They are convenient in that they allow you to quickly run a tape recorder or a note – all of the functions that we need them the most. In addition, further opens up the possibility of Google play, where you can download useful extensions for the function. Smartphone supports handwriting input, however, the stylus is not included in the kit. So if you want to navigate through the menu is not only touches your fingers, but using the materials at hand. 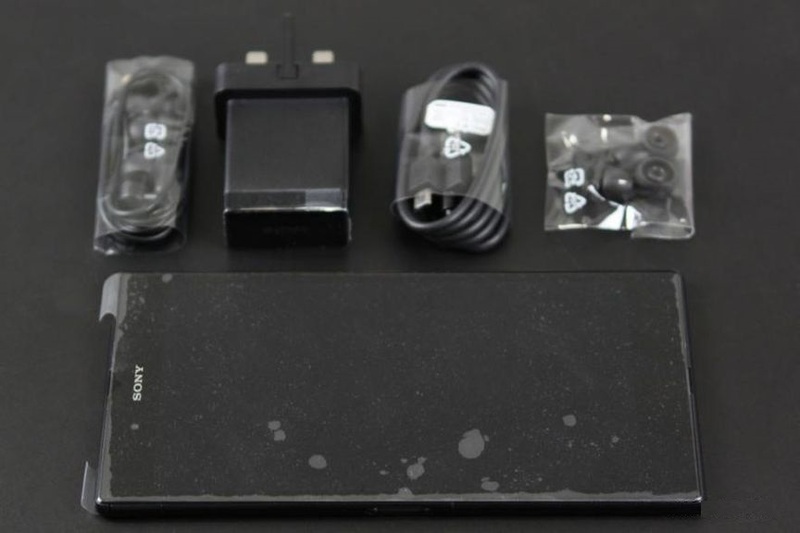 Apparently, not to kill sales of Xperia Z, the new Xperia Z Ultra has received more than a simple module. A separate button for shooting in the smartphone does not have to add, the camera starts as from the lock screen, and through the smartphone’s menu. 8 megapixel Exmor RS module in this model is significantly inferior to the quality of the camera in the Xperia Z. In this way, Sony has artificially limited the capabilities of smartphones. In Xperia Z Ultra has problems with white balance when the pictures white objects acquire a pinkish hue. In addition, details of personnel is not the highest. 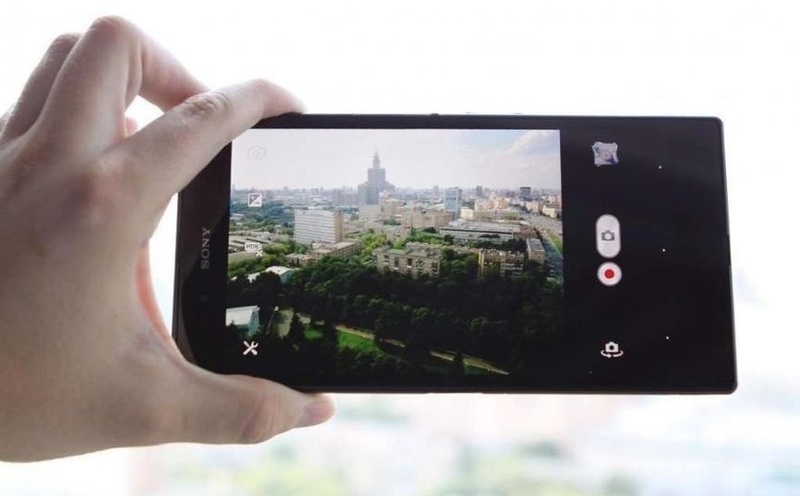 Most users, however, will be pleased with the smartphone camera, but connoisseurs of better quality camera phones will turn their attention to other models. All original photos can be downloaded as a single archive. The music player has not changed, it offers a sort of tracks in several categories. You can manually edit the tags from files, you can use the built-in options to improve sound quality. By itself, the player not loud, so to travel on the subway with your smartphone to get better headphones with good sound insulation. The sound quality is not best, in the same price range Xperia Z Ultra does not take top positions. 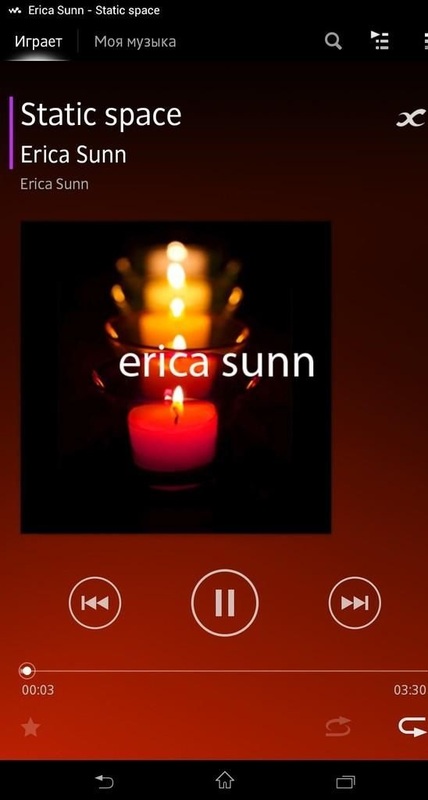 For example, Nokia Lumia 920/925, Samsung GALAXY S4 or HTC One will play music at a higher level. By the way, headphone without a special plug. However, to protect against moisture is not affected. Large and high-quality display is great for watching videos. The smartphone can provide additional information on the video, offering a sort of brief summary for the film. Built-in player copes well with rollers to AVI and MP4, but popular MKV he plays most often without a sound. Therefore, no additional software is not necessary if you want to view videos in HD and FullHD. Xperia Z Ultra easy to assume the role of navigator. The huge screen is a convenient companion for the route calculation, the smartphone offers standard Google maps for this purpose, using a GPS or GLONASS. Despite the supply of such impressive volume, battery life is not impressive. The huge screen quickly consumes energy, so we have to charge a smartphone twice a day, to use all its features. From various energy-saving features no one refuses, they are all the same services offered to the user. These include Wi-Fi and by location, which saves battery, and the mode STAMINA, by which data transfer is blocked by a locked screen. In the test of time, the novelty of the Japanese showed results comparable with the Xperia Z. Video at full screen brightness in FullHD-as played for 4 hours, the same figures we have received in the course of testing the above smartphone. Sony Xperia Z Ultra Sony will be the answer to the growing demand for smartphones with very large screens. Despite the fact that the devices seem to be much too large and uncomfortable, there is another category of people, who like that sort of decision. The huge screen makes it fun to watch high-quality video, play, sit on the Internet or draw, the first time we meet Sony smartphone with this capability. The big advantage of new items has become not only a significant increase in diagonal compared to Xperia Z. Now you do not have to worry about not enough high-contrast or viewing angles. Image quality Sony Xperia Z Ultra is now significantly better than all previous smartphones Japanese brand, the difference in picture can not be overlooked. Again, this model is worth praise for the fact that with such a large diagonal proposed here FullHD-resolution, and other unique phone with a screen of this size and quality in the market. The smartphone went on sale, it has on offer “gray” sellers, whereas in the official retail model is not yet available, but we expect it to cost in the amount of $755. 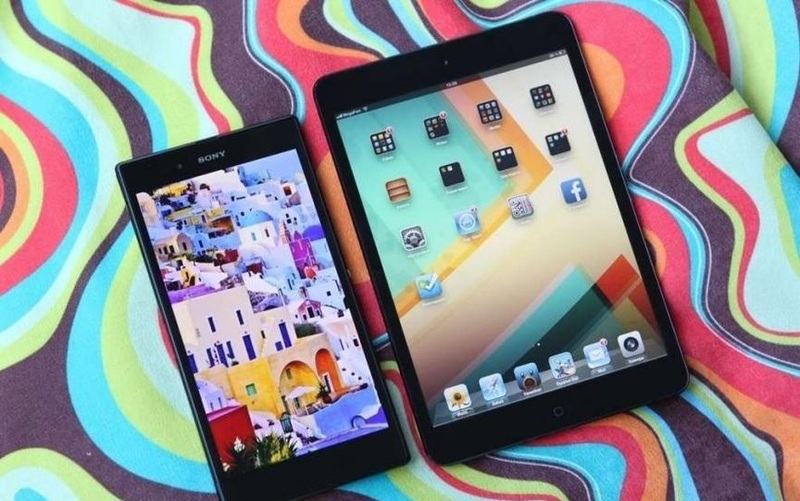 Currently, the average price of $755 a device of this size do not expect high sales, it’s still a very specific format. However, given the demand for such devices, smartphones remain huge fans very happy. Xperia Z Ultra hits record performance and pleases the big screen. Without flaws, however, there is also not done. In the smartphone very average quality recording camera, besides more and disadvantaged flash. Display strange works in Automatic mode, brightness adjustment, and a maximum threshold here is not as big as our competitors. Moisture protection have become a victim of speakers, they are quiet, so hard to hear on the streets of incoming calls. Rounding out the list of deficiencies indicators of battery life, Sony Xperia Z Ultra in this regard can not boast of anything outstanding. Despite the fact that the number of direct competitors is not, find analogues in the market can be. 5.5-inch screen with a resolution of FullHD-is at LG Optimus G Pro, which costs $755, but the “gray” version would cost $ 17-18 million. He has a better quality of the display and the camera, but not so interesting design, design of the interface is also an amateur. 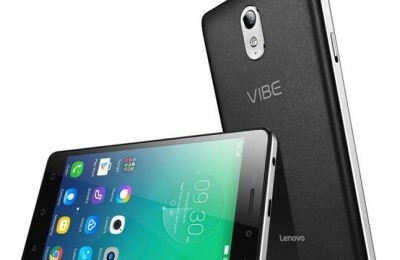 Another alternative could be Lenovo K900 with FullHD-screen and 5.5 inches. He has a slim metal body is well optimized filling from Intel, but the amount of internal memory is only 16 GB and the memory card slot is not provided. But this smartphone in the official retail only costs $515. If no resolution is important, and its diagonal, then why not look at the Samsung Galaxy Mega 6.3. 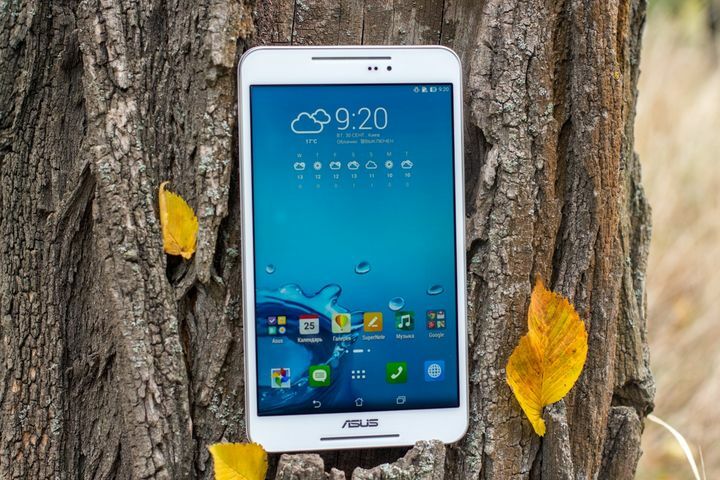 It has a screen with HD-PLS-matrix and a diagonal 6.3 inches, recognizable design of glossy plastic material predominates. Despite its large size, the smartphone is well thought-out ergonomics, high-quality camera, easy video player, multi-function jacket and good performance of battery life. It will cost $605. 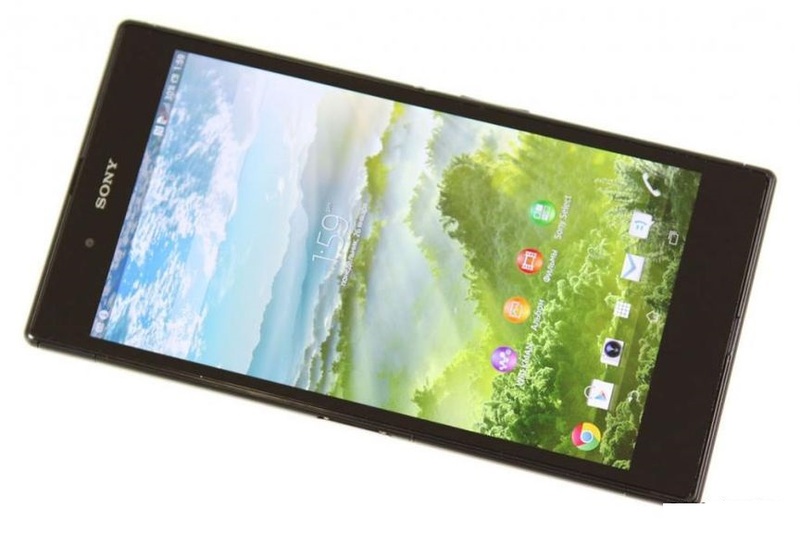 One option could be to Huawei Mate, which has a 6.1-inch IPS-screen HD-resolution. filling in this model is simpler, its own CPU from the Chinese manufacturer is not as powerful as its competitors. Despite the more modern stuffing, Sony Xperia Z Ultra can not be regarded as a substitute for Xperia Z. There are several reasons. 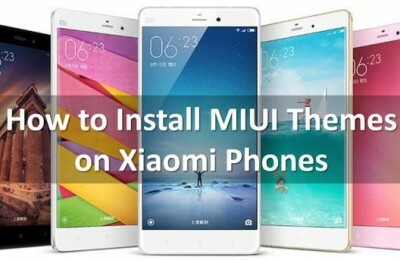 In the first place, is the size of the body, which are suitable not for everyone, a model for fans of technology, and they are less than the buyers, and that a five-inch screen seems to be very large.